As you know, I like to eat game of all kind. 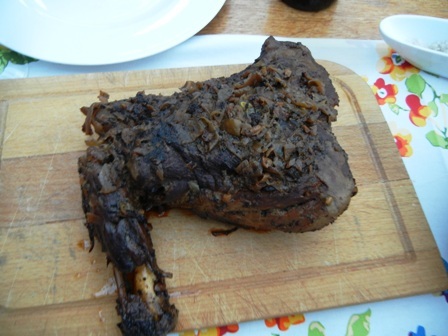 The best wild boar I have eaten in a long time was served to me by my good old friend Ulrich Hillejan and his wife Elfriede when we visited them this summer near Muenster. The so called Muensterland is a very picturesque agricultural region right north of the former industrial heartland of the Ruhr. Ulrich comes from a tranditional farming family which goes back a couple of hundred years (he keeps very impressive records). He inherited one of the traditional farm houses away from the manor house, just outside the nearby village. His mother (I call her aunty Doris) prepared for us the leg of a young wild boar, shot by Ulrich’s younger brother Georg. 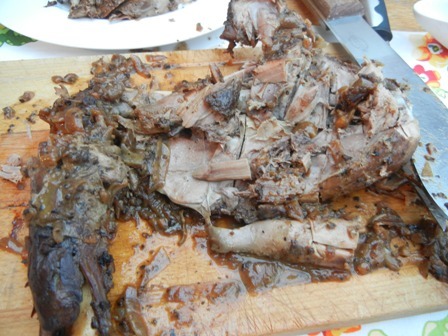 Let me say from the outset that this was the best piece of game I have ever eaten. I asked her to tell me the secret of this delicacy. Her instructions were rather sketchy. I figured that mustard plays a central role. The meat needs to be rubbed carefully with a mustard-pepper-salt potion. The following photos show what we had for dinner. 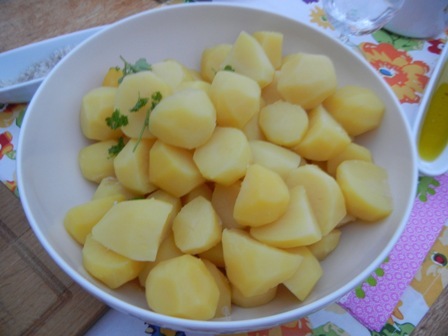 Of course the side dish with the carbs consisted of good German potatoes. 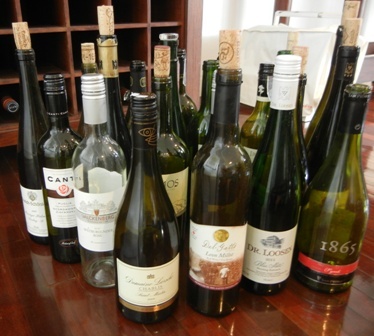 Needless to say that we had various kinds of delicious wines with our meal. 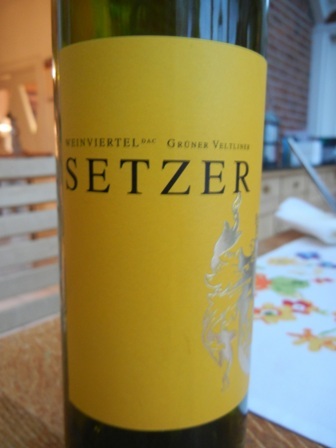 We started the extensive tasting with a white wine, a fresh Gruener Veltliner from Weingut Setzer, Austria. The Setzer winery was decoreated with the “winery of the year 2013” award. The estate has about 30 ha under vines and produces a wide variety of wines. Main grape variety are Gruener Veltliner, and red Veltliner. Recently, Hans Setzer, owner-operater of the estate, was awarded with the “Vinter of the year award” for 2013. With its low (11%) alcohol content, this wine is wonderful for warm summer days. 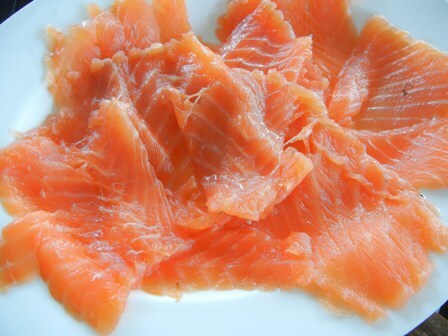 It is refreshing and shows great temperament. 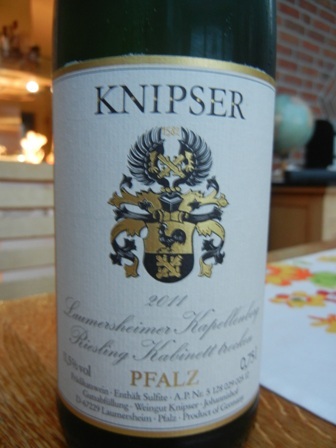 We followed up with a German dry Riesling by the well-known Knipser Estate in Laumersheim, Pfalz.In 2009 the winery was awarded the “vintner-of-the-year” award by Gault Millau. 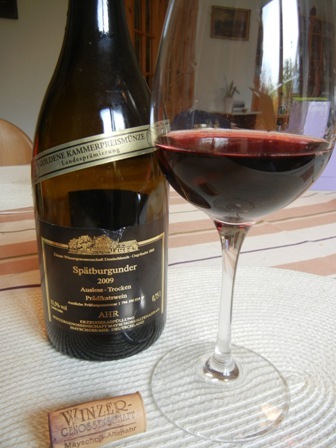 The ‘2001 Laumersheimer Kapellenberg Riesling Kabinett Trocken’ was just the right wine to complement the meal. 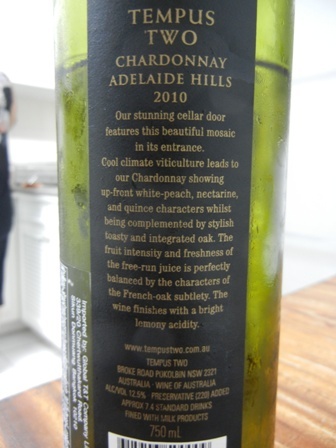 I like the minerally note and the tropical fruit aromas. 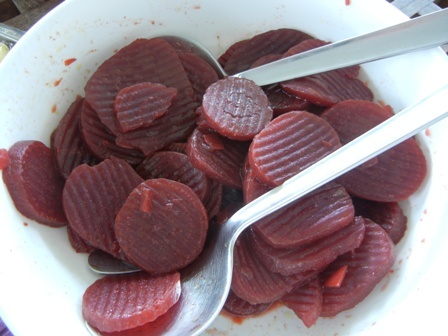 Mid-term through the meal, we changed colour and switched to a red wine from Italy. 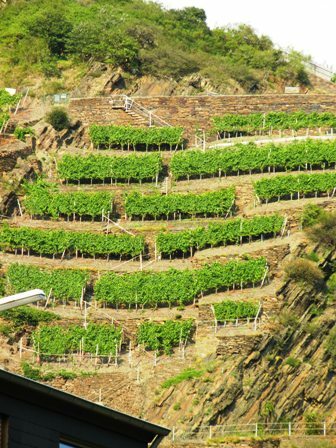 Villa Contessa Rosa has currently about 70 ha under vines. 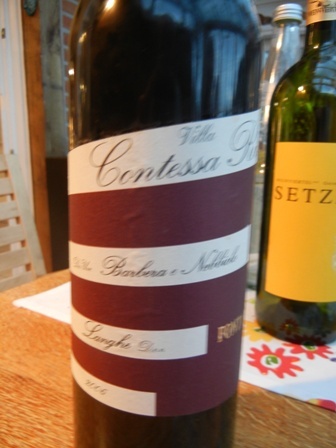 The blend of Barbera and Nebbiolo, produced in the wine region Langhe, was also a good accompliment to the wild boar. 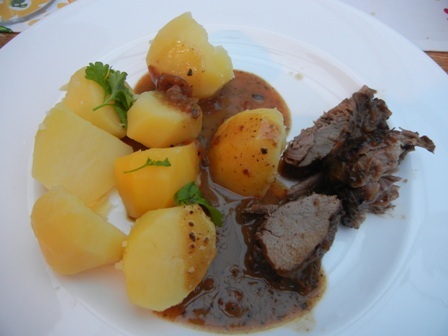 The meat from the forest animal and the red and Forest berry aromas from the wine went well together. Below you see the colour of the drop from heaven. From here on I lost track of the wines we sampled in the course of the evening. 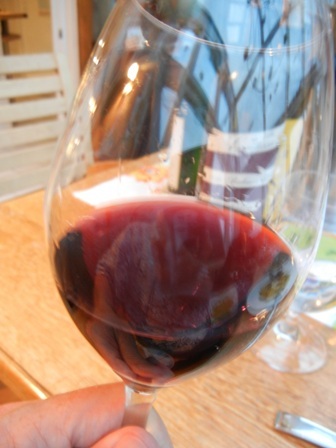 There were a few more red wines, but honestly I cannot recall what they were and where they came from. 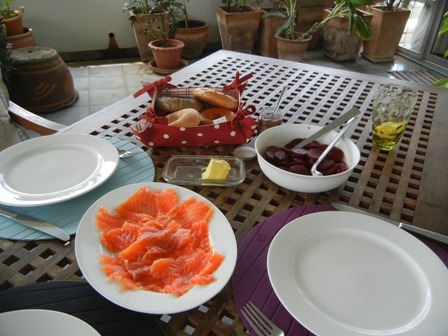 The generosity of our hosts knew no bounds, I might say (thank you again Ulrich and Elfriede). It was a terrific evening of reminiscing about the past and making plans for the future. As you know there is not really a summer in the tropics. We have different seasons than temperate climates. However, when the rainy season has come to an end, days are getting hotter, and the meal I am going to describe is exactly for such days. 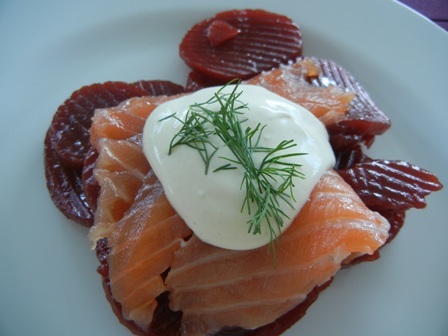 We had a beetroot salad with some cured salmon and a self-made sauce based on yoghurt. 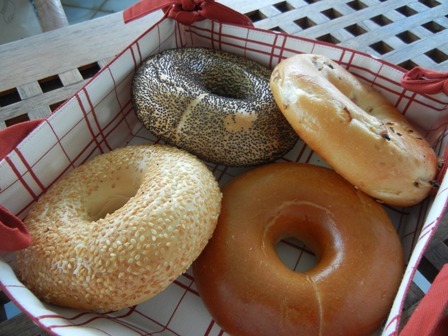 For carbs, we offered a selection of bagels. Look at the photos below. Doesn’t the food look delicious? I would agree that bagels from a proper bakery would be superior to the ones shown above. But hold it. Remember we live in Bangkok! Since it was a weekday, no special wine was pulled from my wine fridge. 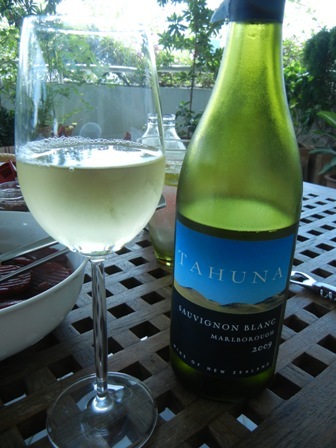 Instead I opened a bottle of a mass produced Sauvignon Blanc by Tahuna from the Marlborough wine region in New Zealand. About a week ago history was made when the first “wine flash-mob” was conducted in Koblenz, and a much smaller one in my home town Trier. I learned it from facebook, and I wished I were there. Funny is that the word flash of the term “flash-mob” sounds like “Flasche” which translates into German as “bottle”. So it is a “bottle mob”. Indeed about 200 wine lovers followed the invitation in Koblenz and congregated at the “German corner” (Deutsches Eck), a public square, where Rhine and Mosel river merge. It was maybe the last warm autumn’s day (according to the organizers 21 Celsius) with blues sky, coloured leaves on trees, soft air with the hint that winter was not far away. Jan Wilhelm Buhrmann and Marco Pusceddu from the wine bar “Gavino” in Koblenz had invited to this un-usual event. The event was part of an initiative by the German Wine Institute (DWI) to promote German wine. The title of the campaign was “become a wine spotter” (or discoverer) and it was conducted in the third week of October. In more than 400 restaurants all over Germany various events were held to promote German wine. The bottle flash mob in Koblenz, planned for only 20 minutes, muted into a two hour public tasting and wine sharing where German “Gemuetlichkeit” reigned. Great stuff. I hope I can be there when they do it next time. Again I present something Greek here. It also comes from “Jamie does…”, the cookery book by Jamie Oliver. Hot days in Bangkok lend themselves in a perfect way to this kind og food, light and refreshing kind of meals. 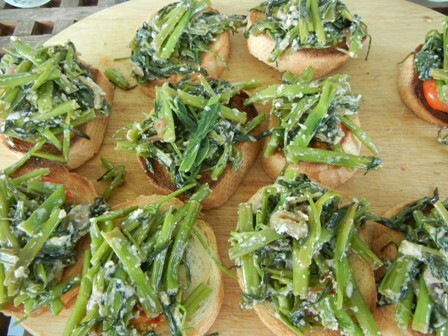 We used an Asian vegetable for the ‘green vegetable on toast dish’: “kangkung” is its Indonesian name. I do not know what it is called in Thai. Sprinkle fresh parmesan on the warm vegetable. The melting cheese provides just the right “glue” to produce a very tasty complement. Some roasted garlic is also added. 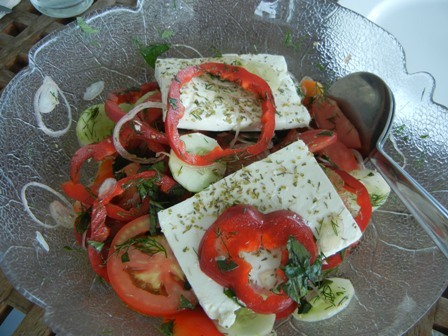 The crunchy bread together with the cheese flavoured green and the fresh ingredients of the salad (tomatoes, red peppers, onions) with feta are just perfect to stimulate your attpetite even on a hot day. Any white wine would have complemented the two dishes, I guess. In style would have been a Retsina, a flavoured wine customaynin Greece. 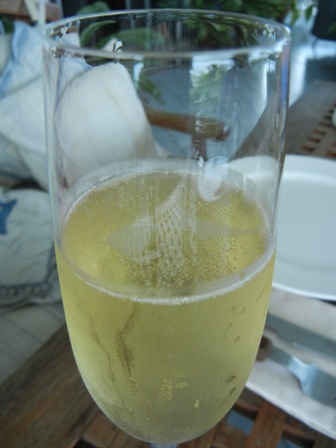 Since we were in a celebratory mood (it was the first day of the school holidays), I grabbed a bottle of bubbly from the fridge. 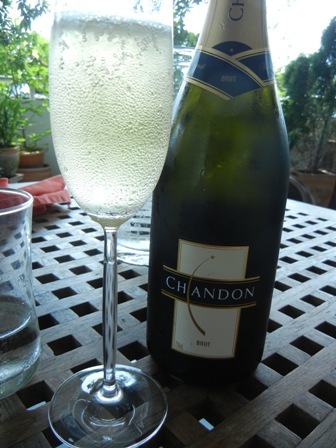 The sparkling from Chandon is not cheap in Bangkok (about 1,000 Thai Bath), but his zesty freshness with the small bubbles made it an ideal wine to have with the Greek food. I love the recipes from Jamie Oliver. 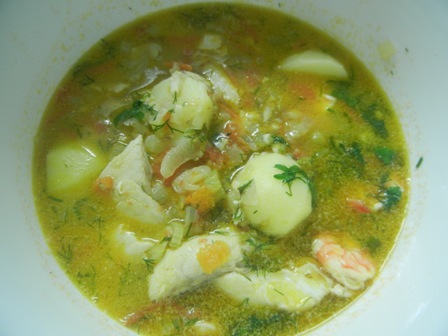 In his book: “Jamie does…”, the Aegean Kakavia, a Greek fish stew, is presented. These days, as you know, there is some kind of weariness between Greek and German people because of the currency and bailout issues. 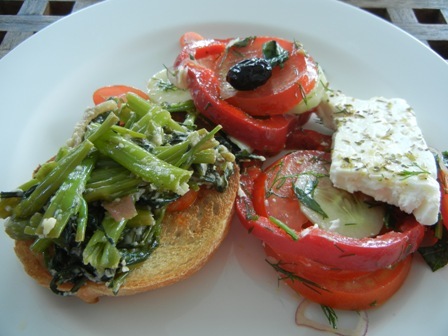 So a Greek dish with a German wine seemed the right pairing; hinting at some kind of reconciliation or just because fish and Riesling harmonize so well? The recipe is dead simple. The beauty is that any fish will do. We had flounder and prawns. Chop some onions, tomatoes, garlic, celery and potatoes and cook it in some vegetable stock, with olive oil, lemon juice, salt and pepper. At the end add some fresh parsley and dill, and voilà, here we are. 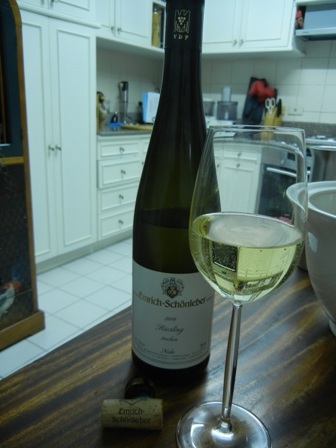 I love Riesling and hold the wines made by Emrich-Schoenleber Estate in Monzingen, Nahe in high esteem. They remind me of my childhood and the time I spent with my maternal grandfather in Martinstein, just a couple of kilometres to the West. This low alcohol (11.5%), bone dry Riesling is a fine specimen of what the Nahe wine region can produce. The wine is fresh and zesty, with intense lemon aromas, well balanced acidity and a long finish. I could have a bottle every day…but since I live in Bangkok, this is hardly possible. The more I treasure this fine Riesling wine. If you happen to pass by the Nahe, visit the winery of the father and son vintner duo and enjoy a 250-year tradition of grape-growing and wine-making. The cellar door of the Emrich-Schoenleber family is a beautiful place to taste fine wines. You will not regret it. The grapes for this wine are actually not coming from the Hunter valley but from the cool climate Adelaide Hills wine region. The wine is a modern product, harvested by machine, made in steel tanks and briefly kept in French oak barrels in order to get the spicy vanilla character. The Tempus Two winery, founded by Lisa McGuigan, a member of the fourth generation dynasty of celebrated vintners, the McGuigans, is situated in the Hunter valley. The cellar door, an ultra-modern building, is just outside Pokolbin in the Hunter Valley, New South Wales in the foothills of the Brokenback Ranges (a region with freezing cold winters). 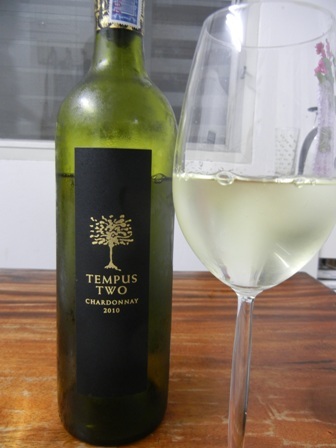 Fruit for the Tempus Two wines comes from many different vineyards wine regions all over Australia. The band was established in 1998 only. This mass produced wine, is something for easy, every-day drinking. Apart from the Chardonnay, the Varietal Range includes a Blanc de blanc, a Verdelho, a Semillon Sauvignon Blanc, a Merlot, a Cabernet Merlot and a Shiraz. The two premium brands are called the Pewter Range, which comes in distinctive bottle shapes, and the Copper Range, with more modern-style wines. 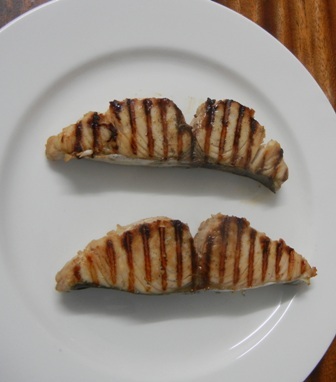 Since we were on a modified Dukan diet ( we made concessions for the alcohol), we had it with fish, a mackerel, which is a strongly-flavoured and oily fish. The wine coped well with the strong fishy taste. The citrus flavours and the high acidity were a great complement to the food. I would have eaten another portion of the fish, and certainly could have had a second bottle of wine. My verdict: highly recommended. PS: In Thailand, Siam Winery is the agent of Tempus Two. You are currently browsing the The Man from Mosel River blog archives for October, 2012.